For that date, 1965, the H.H. Lamb picture isn't bad at all. When I began entering the scene halfway the eighties, the LIA and MWP were still the main features of global temp development over the past millenium/millenia, though the years had begun to touch the upper MWP envelop. 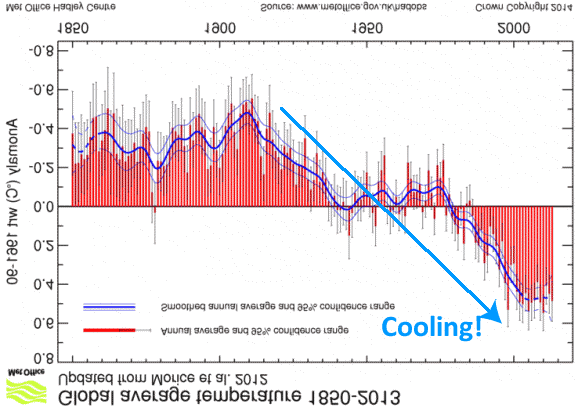 The climate catastrophe since renders those old wiggles of MWP and LIA more insignificant by the year. Singer's demented trick is to have us forget the past half century wholesale. Sure, forget him. I've looked at it more closely and I agree, it's not that bad of a schematic given there was no global or NH reconstruction at the time. I've put in a marker for current temps and the actual FAR chart for comparison above as an update. The graph is cherry-picked in a way that shows that people either never read the original source or else ignored the surrounding caveats, (pp. 199-206) IPCC(1990) where IPCC basically said they didn't know much yet, had doubts of a global MWP. That led to a lot of research, real reconstructions in place of Lamb(1865), by 1992/1993, and all this was gone by IPCC(1995). All of which were different. The curve is ~right, but the image came from somewhere else. WUWT's is identical to that of John Daly, non-scientist "science advisor" to the Western Fuels Association (Powder River coal), here. Daly showed an image of unknown provenance, and then used a false citation that claimed it for 1995, totally untrue, hinting that he had access to neither 1990 n or 1995. He's dead, so we can't ask him where he got it. The same graph and falsehood about 1995 was used by Steve McIntyre in 2005. When Tom Curtis later asked, McIntyre couldn't remember where he got it. The same thing persisted in the blueprint for the Wegman Report, i..e., dog astrology journal, JSE Curiously, a few weeks earlier, McKitrick's talk in Australia got JSE right, but in Washington, JSE became Science. As the Stoat says, it's the Adoiration of the Lamb, although I prefer to call it allegiance to a flat-earth map in an age of GPS..
John, I've added an update comparing the WUWT chart with the FAR chart, and in the animation I've also marked the current, which is around 0.2 degrees hotter than the highest temperature on the schematic. Thanks, the "blink" graph is nice. Note of course, that the spaghetti graph curves not only sued different methods, but the results must depend heavily on the geography they claim to cover. One expect bigger jiggles in a reconstruction that covers 30-90N, 50% of the NH,and dominated by land, compared to ar 0-90N NH (like MBH99), which has more water, or NH+SH, which has much more water. Of course, N. Atlantic-area-weighted curves might swing more, and Central England ... a lot.